If you head eastwards off Kyrenia, you will pass Karakum and behind Karakum on the main road you will spot a red and white Coca-Cola sign on the left indicating the beach. After passing some villas on your way you will come across this small Diana Beach. The shore is sandy thanks to human intervention but the sea bottom is natural and rocky. You can rent the beds and umbrellas for a fee and have a lunch there at the local restaurant. Available are water scooters (40 YTL for 10 mins). 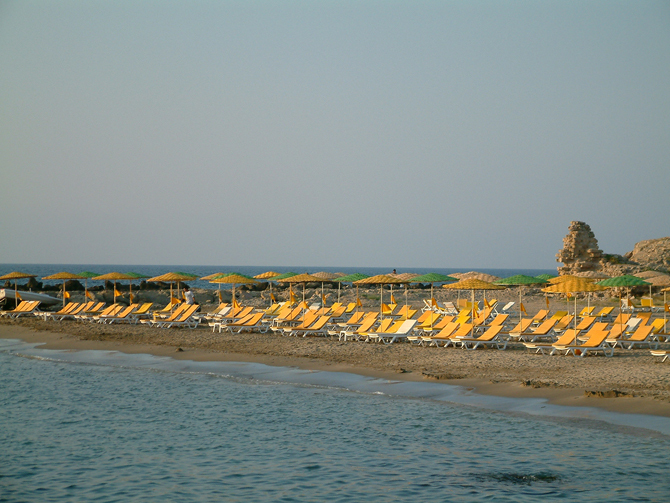 Acapulco Beach lies about 6 miles to the east of Kyrenia. At the point where the coast road to the east sweeps up towards the mountains, a large sign advertising this beach will be seen. Here the road branches off to the left, passing through an army camp before leading to the entrance of this holiday complex. This is a popular tourist beach, offering most facilities, but supervision of children swimming is recommended as there is an undertow. Windsurfing is available. Lara Beach may be found a couple of miles further on - a sign indicates where to turn off from the new by-pass road. Toilets, showers, and beach chairs are available, and there is also a reasonable open air restaurant. 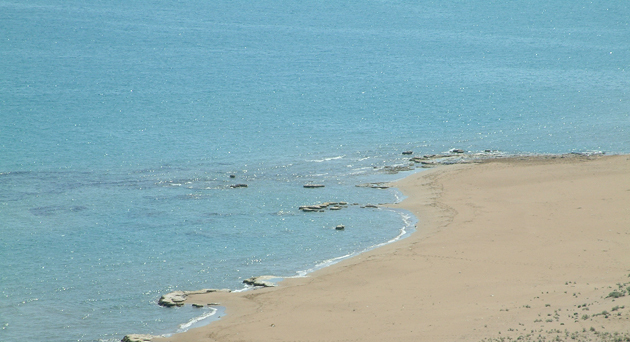 Alagadi Turtle Beach lies still further east, about 10 miles from Kyrenia and you do not need to pay the entrance fee there. After heading east out of the town passing Karakum some miles further you will spot huge sign of Vogue Beach and Acapulco Holiday Resort at the junction on the left. Turn left from the main road and follow the sign. After passing Acapulco on the left the way will lead you to the working place of Alagadi Turtle Beach Project, the sign is directed to your left. A hundred yards or so past St. Kathleen's restaurant is a small bridge. 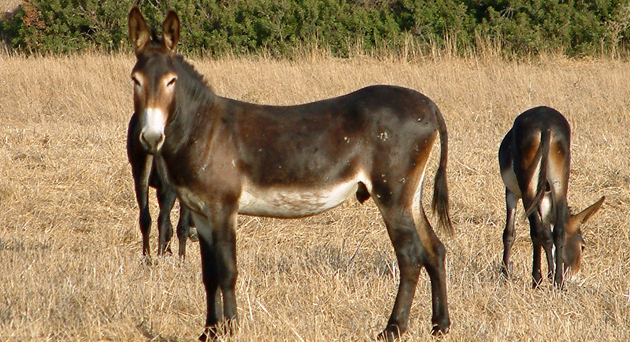 A rough track will then lead you past a farm and through the dunes to a large, sweeping double sandy bay. Alagadi is a sandy beach and the water is shallow up to a well distance. You will find a small island there, but approach with care as the sea surface in its surroundings is a bit rocky and rough. 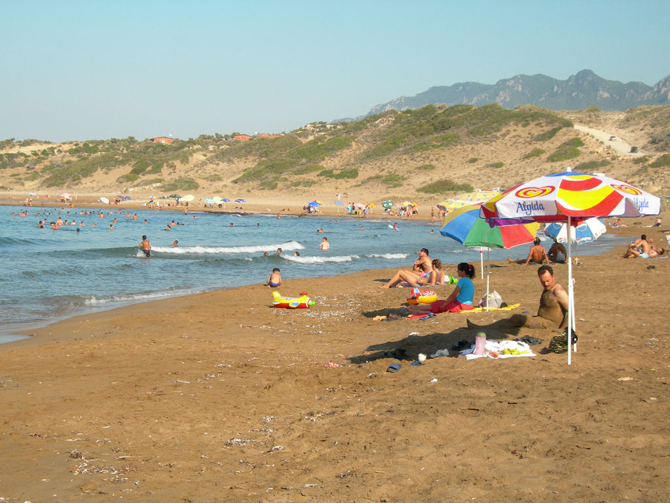 It is common that visitors coming to this beach take their own sun shade, or refreshment. The facilities are limited but there is Green Turtles Beach Bar which is operating during summer and you will find also toilets there. Avoid leaving litter for it is on this beach where the green and loggerhead turtles come and lay their eggs in the summer. During the egg-laying season the beach area for sitting on is marked out with red painted skates. 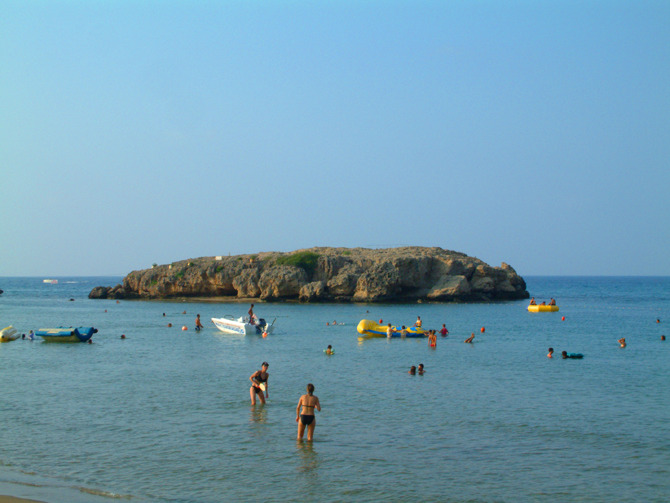 Sunset Beach is located about 5 miles to the west of Kyrenia, past the sloping concrete monument beyond Karaoglanoglu. 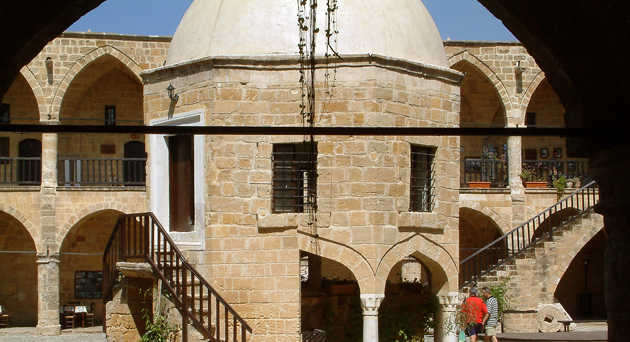 It is adjacent to the Altinkaya fish restaurant. The sandy beach is well protected and ideal for tiny tots. Toilets and showers are available, and there is a bar and restaurant. 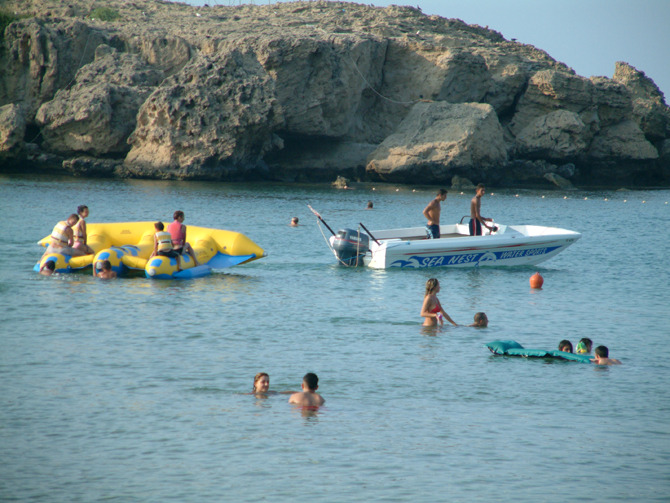 Deniz Kizi is situated about seven miles west of Kyrenia. This sheltered bay is kept clean, and offers a variety of water sports including windsurfing, parascending, water skiing, and inflatable fun rafts for smaller children. Deck chairs are available for hire, and there are also toilet and shower facilities. Mare Monte Hotel beach lies some 10 miles west of Kyrenia, and provides all the facilities the visitor requires such as bar, shower, sun loungers, sunshades etc. A surprisingly attractive small sandy beach has recently been open to the public. Look for the sign for the Alsancak Restaurant, after turning off the main road, head straight, ignoring the red army sign. The area was previously under military control and at the time of publication the warning has not yet been removed. A delightful local meal can enjoyed while looking the sea. Go westwards off Kyrenia and you will find Guzelyali Beach which is situated approximately 10 miles from Kyrenia, in Lapta. You can relax under an umbrella on a seabed (4 YTL) and enjoy the sandy beach which turns into shingles when you enter the sea. Be aware of the rocks inside the sea since you can skid easily. A small restaurant and a bar are available with free toilets. If you follow the direction west of Kyrenia, passing Karaoglanoglu and Alsancak until reaching Lapta, there is this small sandy beach on the right, signed with a small blue sign, and Friends Beach Bar and Restaurant next to it. With shallow water at the shore it is perfectly suited for the children. Available is the restaurant and a bar, free toilets and sun beds at 5 YTL. Kervansaray Beach, Karaoglanoglu, west of Kyrenia, is one of the most famous beaches in Kyrenia with many facilities, restaurants, bars and beautiful sandy beach. 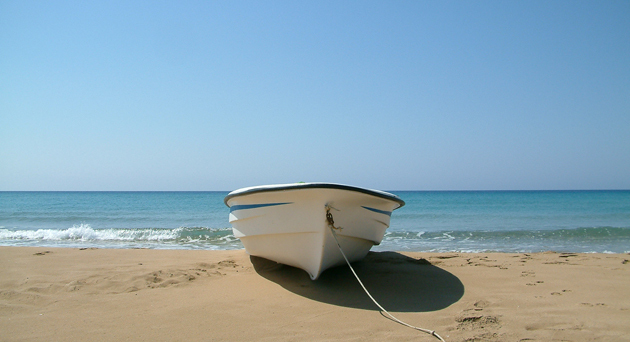 To reach Camelot Beach head westwards off Kyrenia until you reach Alsancak. On your right hand side after about 8 miles drive you will spot a big white sign of Camelot Beach Club. Although there is an entrance fee, on Camelot Beach which is family friendly you are provided with water sports like scuba diving, banana ride, jet skiing or water skiing. This sandy beach is well maintained, with sun shades and beds, restaurant and bar and you can enjoy live music in the club until the early hours. 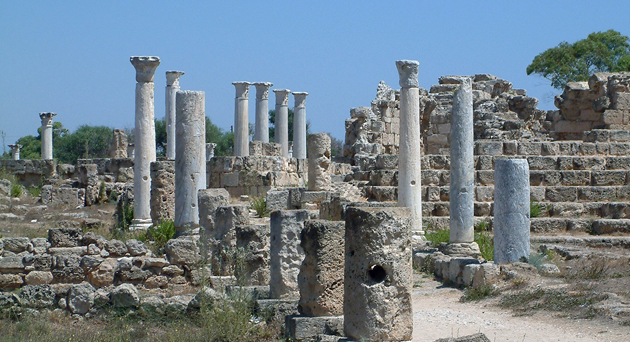 Follow the direction towards Alsancak, westwards off Kyrenia. Approximately 5-mile drive will take you to the white War Memorial on your right hand side. You will find Escape beach few metres next to it, being well-signed. The place is commonly known as Yavuz Cikarma Plaji, the spot where the Turkish Troops landed during the Peace Operation in 1974. Now the area is landscaped with grass, flowers and fauna. To get inside Escape beach you will have to pay 10 YTL. Among the water sports that can be practiced here are jet skiing, banana ride, canoes, pedal boats or scuba diving. This sandy beach is equipped with volleyball area, restaurant and bar, and is indeed a busy summer holiday beach. Especially popular with young people, as there are open air night parties with club music by European Djs held every summer. TM'S (automatic teller machine), enabling you to draw foreign currency while you stay in Cyprus. In recent years banks have expanded their activities beyond traditional banking and their services include insurance, leasing, hire purchase finance, factoring, mutual fund management, investment and consulting as well as custody and asset management services. They have also developed new products and services through electronic means or electronic access, using alternative distribution channels such as the internet, call centers, etc. All types of banking services are provided in Northern Cyprus and they are flexible enough to satisfy the continually diversifying needs of the business community. There are branches in many of the important trading centres of the world. Numerous Turkish and Turkish Cypriot banks (HSBC Bank has now opened branches in Nicosia and Kyrenia in TRNC),operate and they are open from Monday to Friday (except public holidays) between 08.00-12.00/14.00-16.00 hours. Turkish lira is used as the local currency. 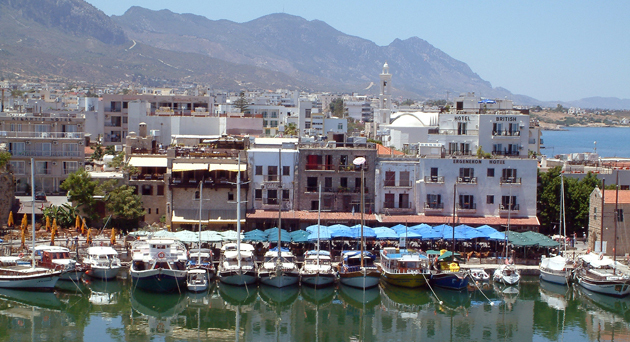 There is no restriction for the import of foreign currency into Northern Cyprus, however, the export of currency is restricted to US-dollars 8000, or the equivalent in other currencies. Exchanging all the currencies in banks, exchange offices and in hotels, is possible. Visa card, credit card, master and euro cards, eurocheques, travelers checks etc. can be used in place of cash.